If there’s one thing we really appreciate here at OPC, it’s multi-purpose tools. There’s something great about having a tool that can address multiple projects and tasks without cluttering up our work bench or using too much of our limited storage space. Over the last few weeks, we’ve been testing Rockwell’s SoniCrafter, a multi-tool modeled after the Fein Multimaster, and one of many entrants in a highly competitive market created by the expiration of Fein’s Multimaster patent (others include the Dremel Multi-Max, the Bosch PS50, and Craftsman’s NexTec). Rockwell shipped us this tool as part of a test kit about 6 weeks back. We’ve used the SoniCrafter to make precision cuts in wood, cut PVC pipe, cut aluminum ductwork, and sand painted and unpainted wood surfaces. Throughout our projects, the SoniCrafter has turned out to be an exceptionally useful tool–one that we’re happy to make space for in an already crowded tool collection. The Highs: Very useful on a wide variety of projects; low vibration doesn’t create quick hand fatigue; variable speed motor is quieter than other models; can use blades from other multi-tools with adapters; very solid construction; reasonable price. The Lows: High cost for blade/pad refills (typical in this genre of tool). The Verdict: A must have tool for every serious DIYer. Variable speed motor with max 20,000 oscillations per minute (OPM). Integrated hex-wrench for swapping blades (takes about 15 seconds to perform a blade change). No kickback. This was evident immediately as we started cutting dimensional 2x lumber and moldings. Because the Sonicrafter doesn’t kick like traditional rotary tools, it allows for very precise control of the angle and depth of the cut. Only rigid, solid materials can be cut. We like this feature of the Sonicrafter because it makes the tool much safer for use. The SoniCrafter will power through wood, PVC, and even metal, but would have a hard time cutting flesh. We should note, though, that it means if your material is loose, you may have a tough time cutting it depending on the circumstances. Wood doesn’t seem to be a problem, but less rigid materials could be. Work in tight spaces: The position of the multi-tool blade down and in front of the motor is key. This tool is excellent for tight spaces, like cutting door jambs on the inside of a closet in preparation for a hardwood flooring installation. Scraping Performance: The Sonicrafter’s scraping blade makes quick work of difficult surface-preparation jobs (like scraping up old ceramic tile, for instance). It works well when you need to decouple two rigid surfaces that are either glued or cemented together. In fact, the more rigid the connection between the materials, the better the Sonicrafter’s scraping performance. 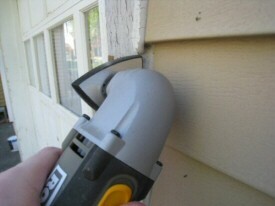 You can also use the SoniCrafter to scrape away old paint. Sanding Performance: The SoniCrafter sands much like a high speed orbital sander with a very small footprint, which means it’s great for finishing and detail work, especially in tight spaces, but it wouldn’t be appropriate to strip down a whole piece of furniture or any other large area. You would want to use the SoniCrafter and a larger sander together for that job. The sanding blades are triangular-shaped, which we liked since it enables sanding deep into corners. They attach to the sanding pad using standard hook-and-loop backings, which means they don’t slip. Grout Removal: The half-moon grout removal tool is designed to dig out 1/4″ grout lines to enable re-grouting or tile removal. We didn’t get a chance to use this accessory but would imagine its performance would be very good on standard ceramic and porcelain tile — although you’d need to be careful not to nick the tile. Note, though, that it can’t be used for removing smaller grout lines (such as those found in bathrooms and showers) as the tool tip is too wide. Polishing: We also didn’t get a chance to use the polishing pads with the Sonicrafter, but would expect them to perform very well considering the sanding performance. We’re very impressed with Rockwell’s offering in this increasingly competitive space. The combination of versatility, ease of use, and safe operation make this one of our tools of choice. (Incidentally, over many other tools, we think the novelty and usefulness of the Sonicrafter make it a good gift idea… if that’s something you’re considering). We haven’t had the privilege of using the original Fein Multimaster, a very expensive tool that the Sonicrafter was modeled after. We’ve heard very good things about it, but are loath to part with the $300+ price tag the Fein commands. The SoniCrafter retails between ~$125 – $200 depending on the kit. You can pick up the best Sonicrafter kit on Amazon, at Home Depot, at Lowes, and at many other retailers. What do you think? Do you own Rockwell’s Sonicrafter? Let us know your experience on the comments! (First photo credit: Amazon. The second is ours. One of the SD cards that contained the pictures for this review is in a stack of boxes do to a remodeling job that required moving stuff. We’ll update the photo when we locate it and post some additional pictures of the SoniCrafter in action). This looks pretty interesting. I have a small Ryobi detail sander that isn’t very impressive. A tool that can sand well and also cut through wood would be a welcome thing at our house! I’ve never seen one of these, but it looks like something necessary to have in my toolkit. I actually need to do exactly what the first picture shows! lol So thanks! This really is a neat tool … especially for cutting baseboard. We’ve used a jamb saw and a regular hand saw to make room for hardwoods and neither is as good a tool as this for getting the job done. I have the Fein and use it all the time. Have you figured out a source for blades yet? Cannot keep the attachments tight. This will cause wear on the shaft. Have no way to contact rockwell about this problem. If anyone knows how to contact the company please let me know. Oh yeah. This is definitely on my list. So many uses and so awesome. We crossed paths many years ago in Southern Pines when you came to visit a high school friend. You’ve gotten older and I’ve gotten old. Back to these oscillating multi tools. I’ve been foolin around with them, using them, selling them, teaching people how to use them, and even trying to explain why the accessories are so $$$. I now work for a blade company, Imperial Blades, which makes quality blades at good prices, but that’s not why I’m here. The oscillating tools are very user friendly, but at the same time a little confusing. I would like to help people enjoy the tool by learning how to make the accessories last longer. People love the tools, but they hate the price of the accessories. I install hardwood flooring, and one of our more challenging tasks is cutting a straight line across several endboards such as a doorway or going under existing trim. I’ve used a right-angle cutter which works well if we can keep the blade tight. Do you know of a brand that may fill our needs? wciąż. Jak słychać właśnie, nul więcej wprzódy nie wymyślę. byle nie przesadzić. Dla pewności napluł w środku dodatkowo zbytnio. makes all the difference when wanting to spend time on a blog. You’ve certainly got me returning for more..